This was my second Spartan Sprint, and a huge improvement over last month. Amazing what a month of CW practice can do! Rig is an IC-7200 running 5W into an LDG IT-100 and 85 feet of wire, strung about 20 feet high. 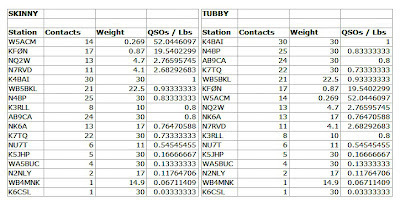 All QSOs on 40m. Got some WX noise around my QTH again this month, especially in the second hour of the sprint. Huge thanks to everyone in my log, and to a couple of you who tried at some length but whom I couldn't quite pick out of the noise. Great fun overall. Thanks for a fun sprint. Wish I could have heard more stations. Maybe next time. I operated for 20 minutes using a Dave Benson DSW with 2 watts on 40 meters. The antenna was an OCF dipole. What a lot of fun. Like the old sprints. Bands were down. Best DX was Larry KFØN in IA. 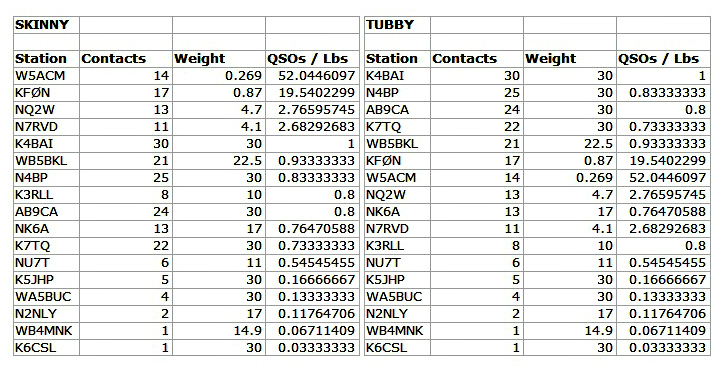 Thanks to everyone for the QSOs. Flex-1500 to 4-BTV: Soft band conditions here in FL tonight and therefore didn’t hear a lot of Sprinters.This was the first time EVER that K4ORD couldn’t hear me, despite numerous tries. Maybe old sol will be kinder to us next month. Thanks for the fun. A better Sprint than many November ones I've had. I took K4BAI's suggestion of last month and stayed with it until the bitter end. First hour was 18 Qs then only 2 more the entire next hour. I was pleased that 20 stayed open as long as it did. 80 didn't show much activity which left 40 as the band to be on. Thanks to all who stopped by and catch you again next month. This is the first Spartan Sprint with my new KX3. I ran the 8 foot magnetic loop with 1-Watt on internal Imedion batteries. Had a fun time on 40 and 80. Didn't try 20. Seemed a bit noisy tonight. The loop and info can be seen in more detail at < http://www.wv0h.blogspot.com > Thanks guys, had fun. Ran my K3 @5W antennas 160, 80 and 40M dipoles, Started on 40M had a good run at first then things slowed down, most signals were weak with very deep QSB and the band was very noisy, I heard several stations calling that I just couldn't pull out of the noise. Checked 20M several times but heard nothing and made 3 qso's on 80M which was also very noisy. Hope December has less QRN. Thanks to all. This was my first Sprint. I guess I just stumbled onto it while listening for some QRPers on 40. It was still early in the contest, so I thought I would join in. I had a great time and made some QSOs: 7 Q's on 40 and 2 on 80. I'm getting back to CW more now and learning to use a keyer, too. Hopefully I'm getting the hang of it. The skip must have been long, because most of my contacts were to the Gulf Coast and SE, and I only heard a few stations in the Midwest. I used an Icom IC-703 at 5 watts and wire antennas. I see now that my 8 lb. gell cell battery is about half of my total gear weight. Next time I'll hunt around for a smaller one and shed some pounds. Thanks to all, it was fun. Missed the first 30 minutes. 20M seemed dead. 40M was good except for long skip. No signals heard from W3, 4, 8, 9 or close in W5. Good signals from Northeast, West, and West Coast. Best signals were from TX and OK, followed by CO, and then MN. 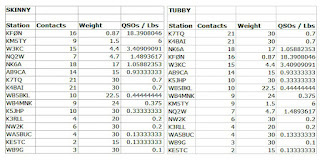 80M had only spotty activity with a lot of QRN but worked stations from VA, TX, and MN. 6 QSOs on 80 and 18 on 40M. Hope to make the whole 2 hours next month. I used my AT Sprint 3 and Whiterook MK-44 paddles; supplied with a 9.6v wall wart. All my QSO's were on 40m. I didn't hear a lot of activity. The QRN on 80m was deafening. Will submit my log to the ARRL's Logbook of the World. Added NiMH internal battery pack to K1 to keep weight down and increase portability. Used the 80/40 filter board at 4 watts, but unfortunately both bands in bad shape due to QRN from local rain storms, generally weak sigs and QSB related to poor propagation. Didn't hear any new stations during the last 45 min--must have worked all available ops or they gave up. Only good sigs were K4ORD on 40M and K4BAI on 80M. Hoping for btr condx later this winter. Was fun anyway. Rig was K2 at 5w to 100' wire. Ended up with 15 Qs. Nearly all were to the N or W. SPCs are CA, CO, TX, MN, MI, IA, NV, ID, and NM. Nothing at all to the NE and not much into the midwest. Started on 20. Heard K7TQ but he could not hear me. Did work NK6A, Don, in CA on 20 but that was it (and later again on 40). The others all on 40. Tried 80 but no one home when I was there. Had only an hour so was probably too early for 80. There was some deep QSB. Not as bad as it is sometimes. Lots of noise from the nearby storms. Thanks to all who stopped by. See everyone next month. It's been a long time since I had the time to work the Spartan Sprint (9 years). I hope to make this a regular activity once again. There were a lot of signals out there on 40M but QSB on most. It would have helped if Ops were not on top of each other - need to spread out. The backup rig - my HEAVY ATS-3 - continues to perform quite well with three LiPo batteries, providing 5W out and a final total of 10 QSOs. The batteries were fully charged this month, so there was some extra power for calling CQ. Conditions were bad on 20M, so I moved to 40M and worked 9 stations from NY to CA. I was using my backyard vertical. I finished up on 80M but with only one more contact with WB5BKL in TX. Participation seemed good although it was spread out over the whole two hours. A low "A" index (2) and a K-index of zero made for some seemingly good conditions with the best coming later in the evening. Twenty meters was a wash here with only two stations worked: K7TQ (Idaho) and K5JHP (Texas). The work-horse band was good old 40M. I heard Jim, K4ORD (VA) early in the evening but was not able to work Jim until much later in the evening when he peaked 579 here. Two stations I would loved to have worked but missed were Don, NK6A (CA) and Dave, AL7LO in Anchorage, AK. Guess I need to upgrade to a full QRP gallon of 5-watts! Many thanks to all who stopped by and rang my door bell! Also thanks to those dedicated souls at Adventure Radio Society who sponsor these fun events. K1 running 5W to a mini-beam at 25ft for 20m, an inverted V at 40 feet for 40m, and a ground mounted, near bottom-loaded vertical for 80m. Started on 20 and heard nothing. CQing didn't even show up on < http://www.reversebeacon.net >;. 40 was better but signals for the most part - except loud K4PHA and K4ORD - were down and QRN was high. Worked one station on 80 - K4ORD for a double - but it seemed like more skimmers were picking up my signal on 80 than on 40. Pretty noisy on 80. Always interesting...wish we had more participation. Thanks to all of the participants and thanks to the organizers. It's been a while and thought this sprint is just what I need to shake down the new 160m inverted L. I fired up the K2 at 5 watts and got at it. Total of 24 contacts. 20 meters was not too hot, only 2 contacts. 80 was QRN city with only 3 contacts. The workhorse was 40 where I worked 19 q's. On my end it was up and down but with positive results. Good to hear so many familiar calls. ATS3, 88' doublet up 60'. Only operated 1/2 hour, only 40 meters. Signals seemed weaker than usual. Thanks for those who called, and sorry I sometimes forgot which memory held the SP exchange! WB5BKL K3/10 @ 5W to a wire delta loop or a dipole. 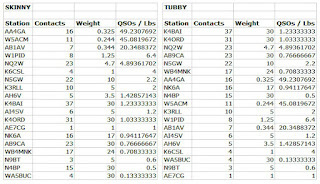 Worked stations on 20, 40 and 80M but most of my QSOs were on 40. Worked K4BAI and W7TQ on two bands. 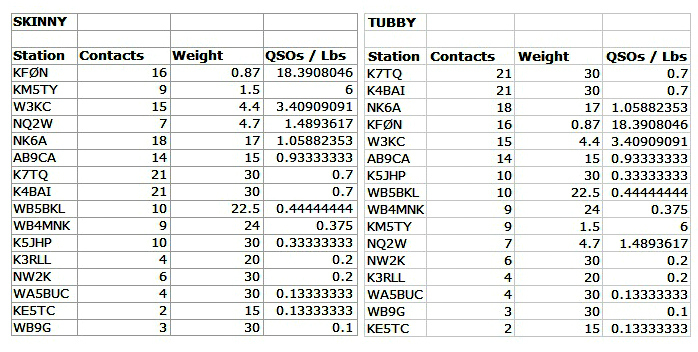 W7TQ was my best DX and WVØH had a nice signal into the Texas hill country at 1 watt. As always, thanks to all. Had fun. Had fun but didn’t hear much activity and noise was ruff. See every one next month. First ARS Sprint with new QRP Flex-1500. Interesting rig but maybe not the lightest weight one with the computer and all. Definitely not “Trail Friendly”. The flat line on the Flex screen said a lot about activity heard here in rural PA tonight. Everyone must be at a Labor Day picnic. Heard few Sprinters but WB4MNK sure had a nice signal out of FL. Nice to work Randy K7TQ on two bands. Thanks to those who make these Sprints happen. A pretty good night. 20 stayed useable for about 1/2 hour and 40 was good here in Idaho until 0210. After that I couldn't scare up another contact even with trying 80 meters several times. 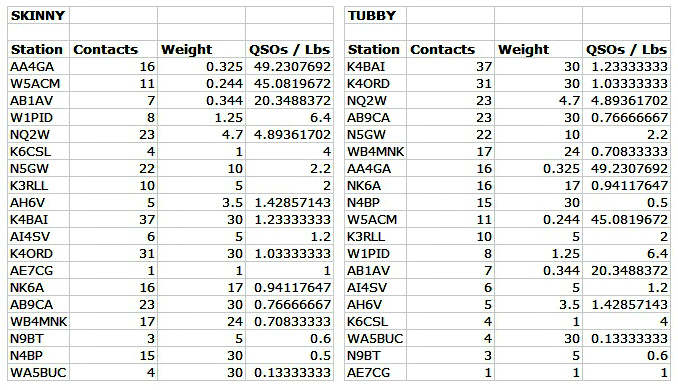 Two band contacts with WB5BKL, K5JMP, K4BAI, and K3RLL. Horrible band conditions this month. Nothing heard on 20m, two stations on 40m, and one station on 80m. Only heard one other station working the MI QRP QSP on 80m. Hope you all had better luck. Was a fun sprint if a little lite. Participation seemed light - probably due to the holiday. 40 was the main band, 10 Q's there and the other 4 on 20. Worked W7OM and NK6A on both. Did work coast to coast on 40. Station here was the K1 at 3w to a wire ran up into a tree near the camper. Felt I wanted something that would let me get on 40 even if it was a compromise. Thanks to everyone who stopped by and we'll see you again next month. Man, where did everyone go? 20 folded about 20:30 CST and 40 went away sometime before 21:00 CST. Hope for better prop next month. Tough copy due to inbound storms kicking up lots of noise. Most activity here was on 40m, with a few Q's on 80 - but none on 20. Fall will hopefully bring better conditions and weather. Same results as last time. 4 Q's. I've not been on since last's month's sprint, so don't know how the bands have been doing. 1 Q on 40, the rest on 20. Signals seemed down on both bands. Heard some signals on 80, but no Sprint activity. Looking forward to the fall bands and hope things improve. Thanks to all who make this possible. Only worked the first hr on 40 meters. Lots of QRN. Must try this again next month and it shouldn't be hard to improve my score! Poor propagation and rather high seasonal QRN from nearby thunderstorms made for rather sparse QSO's but a fun time never the less. I am sure the Labor Day holiday also cut into the number of participants. I ran three watts from my little ATS-3B powered from a stack of AA NiMh cells. The antenna is a 240-foot loop strung between a couple of trees on the lot here. 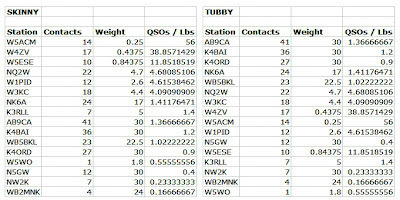 Garry, WA1GWH, had a solid 579 running one-watt from NY. Also, Steve, KØCV in Denver, had an admirable signal here from his 400 mw power level! There were several of you that called me on 80 that I simply could not pull out of the high QRN level but conditions should improve throughout the Fall-Winter season. Thanks to all who participated! K1 running 5W to a mini-beam at 25 ft for 20 meters and an inverted vee at 40 ft for 40 meters. The bands were in rough shape - 1 QSO on 20 and 6 on 40. Sprinters were there according to < http://www.reversebeacon.net > but signals were way down...hoping for better luck next time. 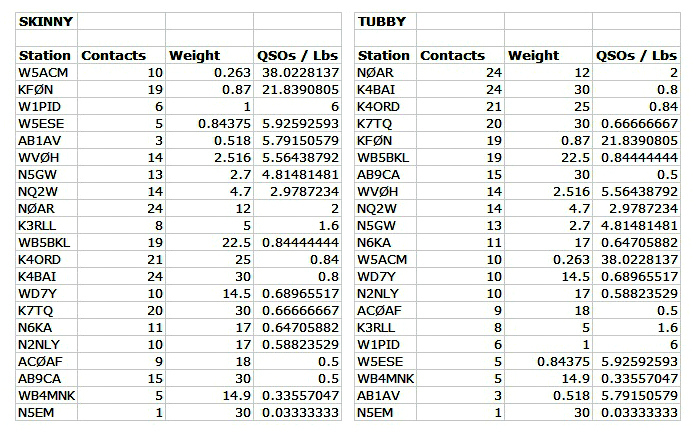 I've uploaded my mini-log to LoTW and eQSL...Hope you'll consider doing the same. Thanks to all of the participants and thanks to the organizers. The conditions were the pits. Knew that going in but didn't expect to get 18 Qs. Was surprised at how loud Nick,WB5BKL,was in Los Angeles. Even copied a few 3 watt stations. A lot of QSB and band noise. After one hour tried 40M and it was better. 45 minutes to go and I decided that I had had enough of noise. Had some trouble with the EFHW so ended up using a 40m inverted vee. Couldn't hear anything on 20m, but 40m was in good shape. First Sprint in quite some time, I had fun but only worked about 1hour of the sprint. Guess everyone was busy with Labor Day BBQs and some had bad weather. Activity was very disappointing. Band conditions were not bad. 20M was open to the west coast (CA, AZ, OR, ID). 5 QSOs. 40M was open to the whole country out about 700 miles. 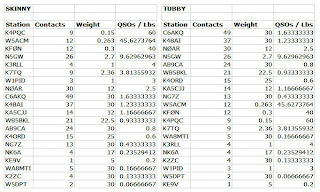 12 QSOs including two in CA. 80M was nosiy, but did work ME and TX. 4 QSOs there. 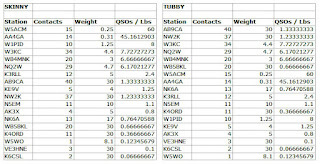 Thanks for all QSOs and hope for much more activity in October. K3/10 @ 5W to a 40m extended double Zepp or a 20m wire delta loop. A poor showing here - only 10 QSOs this time. A perplexing computer problem and a solar flare got to me. Only Don, NK6A and N6GA had truly strong signals on 20M. Worked K7TQ, NK6A, and K4BAI on two bands, but none on three. Had fun. After 15 minutes on 20M, thunderstorms were getting too close to safely leave antenna connected. Static crashes were well over S9, so wasn't hearing anything but the strongest signals. Bands seemed a bit noisy tonight. Started on 15. Heard some DX activity, but no Sprinters. Went to 20 for N5GW and NK6A. Then on to 40 for AB9CA and AJ4AY. Listened on 80. Nada. Noise may have been due to a front headed this way. Looking forward to June. Nice to hear 20 meters alive at 9 PM and fun to work 'old friends' tonight but didn't hear many stations on 40 meters. Thanks ARS, for all your hard work to make this happen. See you next month. I recently got a hold of an FT817nd, and this was my first time using it in the sprint. Up till now, I've either used my main rig a Kenwood 450S (tubby) or a TenTec 1320 (skinny, but one band). I set it up and played with it for an hour before the contest and it seemed quite sensitive for working DX. After the sprint it's pretty clear that my next stop is to get a CW filter. I didn't hear much on 15m, but 20 and 40 had a lot of activity. I worked stations that I know have good antennas, but I think I need more selectivity to pull out the weaker signals.Tnx everyone, and hope to see you next month, qrv from Chicago. Started on 20M and found the band open got a call from LZ2RS who said I was 5db over S9 in Bulgaria he was also running 5W, 12 qso's on 20M, 16 on 40M and 3 on 80M the QRN was terrible on 40 & 80 as much as S9 plus 10db made copy on some stations ruff. Rig K3 @ 5W ant's 40 and 160 dipoles. Thanks for all the contacts. I used our garden 'run to' rain shelter to stay dry. (Hawaiian rain forest). The rig was KX-1 with internal battery and running 1.2 watts to a dipole supported by trees. Very few stations on other than a horrendous pile up at 14.027. All my contacts were easy but very few stations on air. I used only 20 mtrs. as 40 was not ready at my local time. I've used this setup on FD with good results. I finally got my ATS-3b built and was able to operate my first Spartan Sprint with the new rig. I was running about 2w from the ATS-3b using a 9 volt Energizer lithium battery, a thrown-together-at-the-last-minute touch paddle and some new earbuds. Photos of the setup are at aa4ga.com. I was really hoping for at least 20 QSOs, but just couldn't make it happen. I called CQ a good bit, but never got anything in the way of a run going. I was afraid the battery was going to poop out before the contest was over, but it was at 8.6 volts when the contest ended. Great signals from K4BAI and K4ORD. With the QRN, it may be fall before the bands are really enjoyable for this one! I started out on 20M which was initially open because of longer late spring days. Then about 30 min. later 40M opened up. After the first hour, the pickings were slim, so I went back to the cabin where xyl and I are on vacation on the Tn Cumberland plateau. Rig was a K1 on battery to hb tuner & cfz apex 50' in oak tree. See you all next month from home QTH in MS. I operated about 20 minutes on 20 meters with the HB-1B at 4W to an OCF dipole. Rapid QSB. No west coast. Nothing on 40 or 80. Thanks for the contacts. For the first time in a long time 20m turned out to the workhorse band - 13 Q's there vs 10 on 40. QRM was high so did not try 80. Condx were different. The QSB on 40 was bad. Quick and deep. Guys would pop up then disappear. 20 was not so bad. Strongest station heard was AJ4AY - of course Jay is only about 40 miles away. He had a really good signal on 40. Best DX was Don in CA. There was one station, I think the call began with W5W... but can't be sure because I could never get decent copy. Sorry that I missed you. Only had about an hour available, but it was a fun hour. Station was the usual K2 at 5w to one of two wires up 40' - 50' between the trees. Thanks to the organizers and everyone who heard me. See ya' next month. FT1000MP, WM-2 QRP Watt Meter, 5W output, TH6DXX, dipole, inverted vee. Activity still down from what we have had in the past. 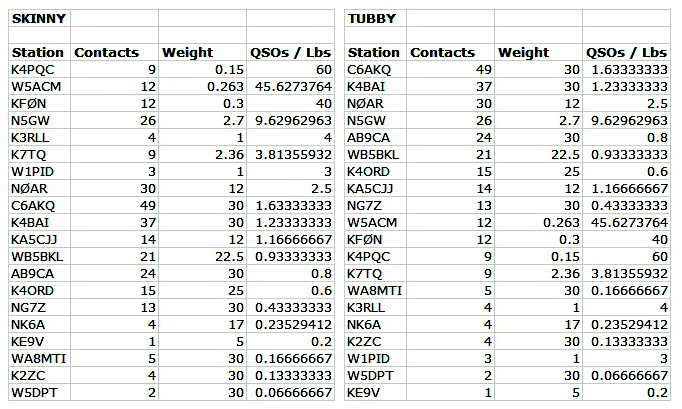 20M was quite good with stations as close as VA and FL workable as well as New England, WI, TX, and CA. Best DX was a quite loud 5W signal from Rumi, LZ2RS, in Bulgaria. We have been having thunderstorms this week and the lower bands were quite noisy. 40M was good with no real skip zone and stations in GA and nearby states were easily worked as well as out to New England and Texas. No activity heard below 7039 kHz this month. 80M was almost a washout with only QSOs in FL, GA, and VA. 20M: 15 QSOs. 40M: 20 QSOs. 80M: 3 QSOs. Sure enjoyed operating the sprint. Signals seemed pretty good on the bands. There were poor band conditions on 20M after the first half hour - heavy QRN, a "static blizzard." Thanks to K6CSL for my only QSO from 0215-0216Z on 20M. Rig here is an MFJ Cub running 2 watts to a 10-foot high dipole. K1 running 5W to a mini-beam at 25 ft for 20 meters, an inverted vee at 40 ft for 40 meters, and ground mounted, near bottom-loaded vertical for 80 meters. Made 13 Q's on 20 and 10 on 40. Switched filter boards to try 80 but didn't make any Q's there. Participation was pretty good again this month...great to hear so many QRPers during the sprint. Good news/bad news...heard more stations than I worked. Looking forward to next month! Thanks to all of the participants and thanks to the organizers. ATS3, touch-keyer, 450mAh Li-poly, Zmatch tuner, 88-foot doublet up 65 feet. Got off to a great start on 20 meters with stations up and down Eastern US. After 9:30 traffic net made 1 contact on 40m, then Rx seemed to go deaf after I called CQ a while. Trouble-shooting time? Beat last month, anyway. I once again used the heavier ATS-3 in the Altoids box with three LiPo batteries running five Watts out. I found 20M exceptional, at least for the first hour, and then no one was left to work! 40M conditions were not as good, with plenty of noise. Only one of my 11 contacts was on 40M. C U next month! Had fun, but was too sleepy to work many stations. Operated for half an hour with an HB-1B at 4W. Bands very noisy but worked NK6A in CA on 20.Thanks everyone for the contacts. even if I didn't hear too many tonight. Thanks to KI6SN and those who put on the Sprints. These are fun. as getting to the field for the Sprints like I used to do during the summer months. The MT rather than ID caught some folks who recognized where I ought to have been. NK6A, K4BAI, and K4ORD caught me on both 20 and 40. 20 held up quite a while, for more than 45 minutes, a sure sign of spring. Catch you all next month. Hadn't been in the sprint for a while and felt like hopping back in. I had bad noise across the board, probably from a local source. 20 was clear, but started longish. later thinned to K4BAI, who sounded very echoey, so probably some weird multipath thing going on. A bit up the band, I could hear NQ2W well, but he couldn't hear me. Started out with good rates, good signals, and fair skip on 20M. Then 40M had fair signals and no long skip, but very high QRN. Rates dropped dramatically. Took out a few minutes for the state CW net at 0200Z. 80M had terrible QRN but worked GA, FL, and VA. Think AI4SV called on 80, but couldn't hear his exchange on that band. Best DX was VE3EUR/VE7 on 20M. 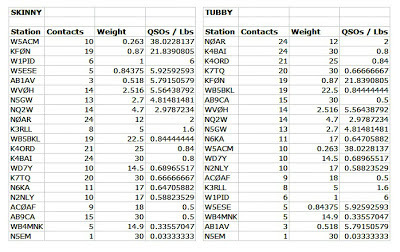 Thanks for all QSOs and hope for better activity and better conditions next month. October. Hard to believe so many have slipped past. QRN was high on 40m. 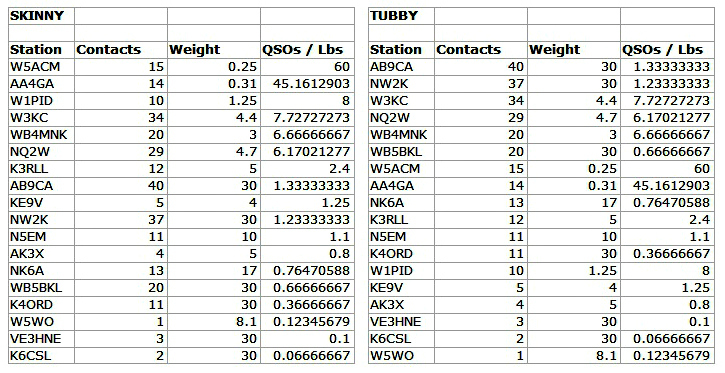 Will submit my log to ARRL's 'Logbook of the World'. - only two contacts on 40M this time, and none on 80M. Got in late but Enjoyed it. Thanks John K4bai for 80 meter contact. organizers. Hope to hear you all again and more next month. Turn out was down from last month maybe the QRN was wide spread? Until next month . . .